Women’s Health Expo Coming Up Next Week! Our annual Women’s Health Expo is fast-approaching (May 13!) and all the details about demo schedules, brunches, and sponsor pop-ups are all listed below! Hope to see you soon! Enjoy: Complimentary swag bags, healthy treats, interactive demonstrations, screenings, mini-massages, fashion show, fun photobooth, shopping at various pop-up boutiques, and learning about local health experts and services! Plus, one lucky attendee will win a $1,000 spa+jewelry prize pack! This week is our “Health” issue of Cincy Chic where we feature lots of new local health-related services, products and experts. I’m love love loving the new Victor Athletics line we wrote about that’s getting started by the Noble Denim folks, thanks to their local love and successful Kickstarter campaign. I also enjoyed reading our feature story about the founder of Game On Fitness and how she – a single mother of two – was inspired to help people get fit after her mother was diagnosed with cancer. Lots of great health-related goodies, and a few extras – like my weekly “Letters to Lola” note to my daughter – you can enjoy! Make sure you’re subscribed (it’s free!) to be the first to know when we have new event and editorial to share with you! Speaking of events (and health-related goodness), we have our annual Women’s Health Expo coming up on May 16 and I’m REALLY excited about it! We just announced our speaker series, and I’m also booking a bunch of hands-on demo experts, like a self-defense gal, healthy cooking expert, and more! We’ll be posting details about all that soon, but click here to RSVP today (it’s ALSO free!) 🙂 Details are below — hope to see you there! A free, fun and informative event! Enjoy complimentary health-enhancing seminars with local physicians, swag bags, healthy treats, health screenings, shopping at various pop-up boutiques, and learning about local health experts and services! One lucky attendee will win a $500 spa and jewelry prize pack! Brought to you by Cincy Chic, the only online publication for women in Greater Cincinnati. FREE Women’s Health Expo This Saturday! 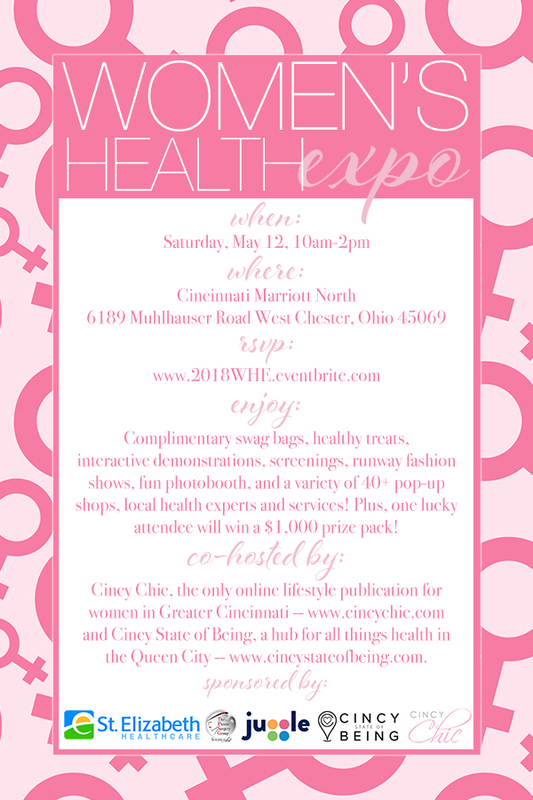 As part of National Women’s Health Week (May 12-18), me and my team at Cincy Chic are hosting our second annual Women’s Health Expo at The Phoenix Saturday May 18 from 10am-3pm. I’m honored to host this free, fun and informative event again this year! And it’s going to be better than ever! We have some great speakers, lots of new screenings, fun fitness demonstrations, interactive preparations of healthy snacks, plus an expo hall packed with vendors where attendees can learn about health-enhancing new products and services! Click here to learn more and RSVP. The Phoenix is located at 812 Race Street, Cincinnati, OH 45202. Parking is available for $2 in the adjacent Garfield Garage on 9th Street. The St. Elizabeth Healthcare Mobile Mammography Van will be onsite at the expo. Those interested in scheduling a mammogram on the van the day of the event can call 859-655-740. Everything is coming together for our Women’s Health Expo this Saturday! I’m so excited! This will be our biggest event yet! We have about 800 RSVPs (my goal is 1,000 so bring your family and friends… hey, make it an early Mother’s Day activity! haha! ), vitaminwater will be mixing up “skinny-tinis”, lululemon fashion show at 11:30 and 1:30, tons of health-focused vendors, speaker seminars and health screenings. Below are all the details. Hope to see you there! Click here to RSVP! A free, fun and informative Women’s Health Expo! Enjoy health-enhancing seminars with local physicians, healthy treats and drinks (with take-home recipes), health screenings, shopping and learning about local health experts and services! 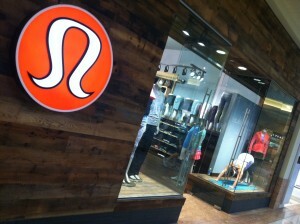 Also, don’t miss the “Function in Fashion” show featuring the latest styles by lululemon athletica. Plus, several lucky attendees will be randomly selected to win lululemon athletica shopping sprees and even round-trip Ultimate Air Shuttle tickets to New York City! First 400 to RSVP will receive a reusable tote bag filled with swag! Childcare Sponsor: Your Event Sitters, LLC – Click HERE to schedule your on-site childcare at the event! Booth Sponsors: Bella Forza Fitness, Advanced Wellness, Peak Performance, Miche Bags by Dale Goldman, Votre Vu by Julena Bingaman, Mary Kay by Britt Born, Pure Romance by Stephanie Muth,Frostconnection.com, Lisa Robin Jewelry, Dawn Yunker – Shaklee Independent Distributor,JuicePlus, CardioDanceParty, Thoma & Sutton Eye-Care, Upper Cervical Health Centers of Blue Ash, HRCMedical, Krumme Clinic of Chiropractic, Norwood Chiropractic, City Dermatology and Laser, Healthier Choice Weight Care Program for Women, Good Life. Good Earth., Organo Gold Coffee, Loving with Purpose, Ohio Drug Card, vitaminwater, Dr Amy Brenner and Associates, Period Panteez, Any Lab Test Now, Whole Step Wellness, Yelp, and more! Lots going on at Kenwood Towne Centre this weekend! We have our Indie Collectionevent going on (basically several local designers selling their wares in a pop-up shop in front of Starbucks in the common area) and the Lululemon store just opened! The Lululemon ladies and I have been working together a ton lately (they’re doing the “Function in Fashion” show at our free Women’s Health Expo next Saturday) so they’ve been telling me about it for months now and I was so pumped to see the final product. I checked it out, snapped a bunch of pics for the blog (yes, that’s a real person doing yoga in the window!) and took the below video of it so you can virtually check it out here! But… I must say, definitely check it out in person! The clothes are amazing, the people are super friendly, and their free fitness classes are always so fun (and did I mention free? )!